The San Diego County Hispanic Chamber of Commerce Tuesday announced its endorsement of Measure G, more commonly known as the SDSU West initiative. The SDCHCC’s board of directors unanimously approved the endorsement, emphasizing SDSU West‘s planned academic research campus. With more than 500 members and affiliates, the SDCHCC bills itself as the largest organization in the San Diego region that represents the San Diego-Tijuana Hispanic business community. 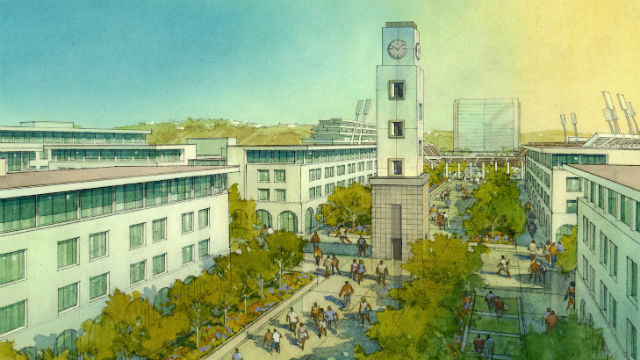 SDSU West — one of two redevelopment plans for the SDCCU Stadium site in San Diego’s Mission Valley — calls for a 35,000-seat football stadium, commercial and residential space, a river park and the academic campus. The competing SoccerCity initiative proposes a 23,500-seat stadium that would accommodate SDSU football as well as soccer matches, along with a similar plan for a river park, a campus extension and commercial and residential space. SoccerCity is being funded by La Jolla-based investment firm FS Investors and has received public support from former Olympic soccer players Landon Donovan and Shannon MacMillan, as well as Univision Deportes President Juan Carlos Rodriguez. SDSU West is backed by the Friends of SDSU alumni group, and has been endorsed by the Sierra Club, the California State University Board of Trustees, the Asian Business Association of San Diego and City Council members Barbara Bry and Lorie Zapf.